The Department of Homeland Security (DHS) will not renew immigration protections for some 200,000 Salvadoran nationals in the United States, the administration announced Monday, bringing to an end more than 17 years of protected status. Senior administration officials said that Salvadorans resident in the United States under previously extended Temporary Protected Status (TPS) will have until September 9, 2019 to seek alternative status or make plans to return to El Salvador. TPS, established by the Immigration Act of 1990, is meant to protect foreign nationals located in the United States whose home countries have become substantively unsafe during the time of their residency. Threats which qualify an immigrant for TPS include ongoing armed conflict, an environmental disaster, or some other extraordinary condition. TPS grants protection from deportation, as well as work authorization. It does not, however, allow for a path to permanent residence or citizenship. El Salvador received its TPS designation in March of 2001, following three successive earthquakes in the central American nation over the preceding two months. Those disasters left over 1,000 people dead, and more than 17 percent of El Salvador's population displaced. Since then, the DHS has repeatedly extended TPS for Salvadorans in the United States. The most recent extension, under the Obama DHS, cited ongoing environmental disasters, lack of housing and power, and gang-related insecurity. However, Secretary of Homeland Security Kirstjen Nielsen concluded that the original conditions that led to extension of TPS status to El Salvador, namely the effects of the 2001 earthquake, are no longer an issue. 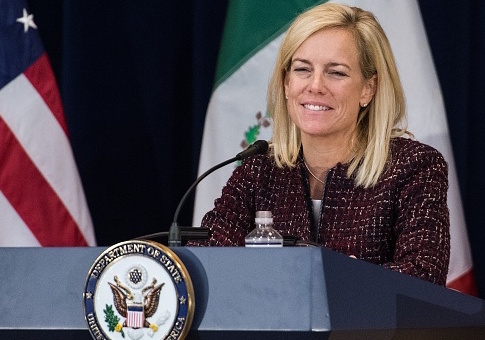 The DHS, which said that Nielsen had spoken extensively to stakeholders, pointed to repaired schools, hospitals, and infrastructure. It also noted that some 39,000 Salvadorans have been repatriated to their home country over the past two years, indicating that El Salvador is equipped to manage a return of its citizens. Monday's announced revocation will have a significant impact on a population that has, in some cases, lived in the United States for more than two decades. Data from the Center for Migration Studies estimate that 88 percent of Salvadorans in the country under TPS participate in the workforce, with just 5 percent unemployed (only slightly higher than the national rate). Those jobs are concentrated in construction, food services, and landscaping. TPS Salvadorans also have 192,700 children, who are legally citizens if born in the United States. It is unclear as to how many Salvadorans currently protected by TPS might be able to seek permanent U.S. residence through their children. Despite DHS's assessment of the aftereffects of the 2001 earthquake, the situation on the ground in El Salvador is grim. A 2016 report from the State Department points to widespread corruption, violent crime and extortion in poor communities, weak rule of law, and other negative conditions. Although DHS limited its reason for ending TPS for Salvadorans to the end of the earthquake's effects, it may also have been motivated by the administration's concern with El Salvador-based transnational drug gang MS-13. Fighting the gang's violence and trafficking has been a priority of both Attorney General Jeff Sessions and his Salvadoran counterpart. It is unclear how many, if any, Salvadorans covered by TPS are members of MS-13. Critics of TPS also point out that TPS is far from "temporary," leading to a backdoor permanent residency for hundreds of thousands of aliens. "In practice, TPS is renewed as many times as necessary to ensure that no one is deported. Only in the smallest of cases, involving a few dozen or at most a few hundred people, has this ‘temporary' status actually been ended without everyone getting a green card, and as far as I know, no one has ever been made to leave because they lost TPS," said Mark Krikorian, executive director of the Center for Immigration Studies. DHS did not suggest it would actively pursue alternative protections for Salvadorans facing deportation. Rather, officials said they hope to work with Congress, which, they repeatedly emphasized, now has 18 months to legislatively enact a lasting solution. This entry was posted in Issues and tagged DHS, El Salvador, Immigration, Kirstjen Nielsen. Bookmark the permalink.